For my propagation and radiation class Shawn Santana and I designed an 802.11 antenna. We decided we wanted to make a directional antenna, and decided on an array of dipoles over a reflective back plane. We originally thought about creating an array of anywhere from 4 to 16 elements with a reflective back plane. We modeled a single element, four elements, eight elements and 16 elements in 4NEC2X all with a reflective back plane about 0.2 λ behind the elements. You can see from the radiation patterns below that as you add more elements you increase the gain and the directionality of the antenna. However, as we started on construction we soon realized that our original plans of a large array were too ambitious. All of the elements were simple 1/4 λ dipoles with a ferrite bead on the end to act as a balun. Our four element array was designed to have an impedance of 50Ω. However when we hooked all of our dipoles together we were not anywhere near our simulated 50Ω. We tried various things and finally narrowed the problem down to the soldered connections of the coax cables to the BNC. We didn’t solder it very neatly the first time, but even after multiple resolderings, keeping things much neater, we didn’t have much luck. The BNC connectors that we were trying to solder onto weren’t very suited for it. The center conductor was a long way from the outer shield which meant you had to peal back a longer length of your coax which added enough parasites to be a major problem. If you had a smaller BNC to solder to, and you were extremely careful you could probably make a clean connection but it would be tricky. To remedy this problem we decided to go with a single element soldered directly onto the BNC connector. We modeled the dipole in 4NEC2 to have 50Ω impedance, the model is available here. As you can see it is much easier to make clean connections straight onto the BNC and we had much better results with this. Initial testing just holding it over the ground plane showed our impedance to be almost exactly as modeled. All of our impedance testing was done on an HP 8753E network analyzer that our department acquired this year. As you can see we had 44 – j15 Ω of impedance. We then worked to find a clever way of mounting the dipole above the ground plane that would allow for easy height adjustment to ensure proper impedance match. Below you can see the simple setup that was used. This didn’t effect our impedance too much, and if anything only helped by letting us have more control of our antenna. Once we had the dipole mounted on the nylon screw, (nylon is very neutral at 2.4 GHz) we were able to adjust it up and down to get the optimal impedance and ended up very close to 50Ω. The final impedance was 44.2 – j5.5 Ω. Considering the values we had been getting previously, we decided this was pretty well and thought it was time to see how our antenna performed. We tested it up on the roof of our engineering building, hitting an access point on the roof of a nearby building. The radiation patterns show how well our antenna performed. The numbers around the side are horizontal angles in degrees, and the numbers down the middle are signal strength in dBm. As you can see there isn’t much to interfere with the signal except the one structure on the left in the first picture, so we got a pretty symmetrical pattern. We decided to try it again next to a metal wall to see what effect that had. Again horizontal angle in degrees and signal strength in dBm. You can see that we get the strongest signal pointed right at the access point and at the metal wall. This is because you get a very strong reflection off of the metal wall. If we held the antenna just right we could even get a stronger signal off of the wall then we could get pointed at the access point. 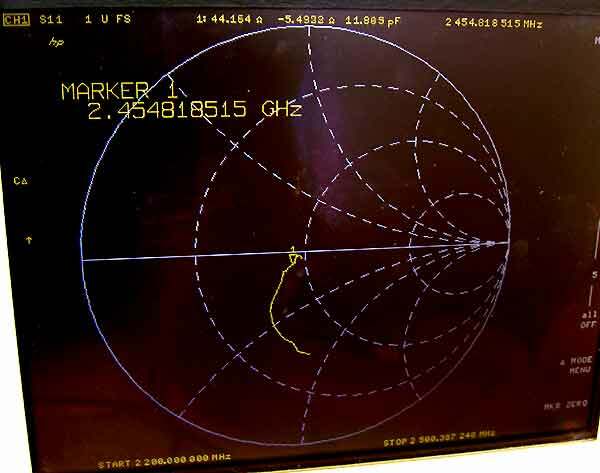 Below is the zenith (vertical angle) radiation pattern. We took this data in the first location (not next to the wall) in 5 degree increments. The signal strength is still in dBm. Using a ruler, just two pieces of wire to be about 2.72 cm long. These are going to be the two sides of your dipole. Solder the two pieces of wire onto the two terminals of whichever connector you decided to use, making sure that they are 180 degrees away from each other. Using your mounting apparatus, mount the dipole 2.2 cm above the reflective plane. 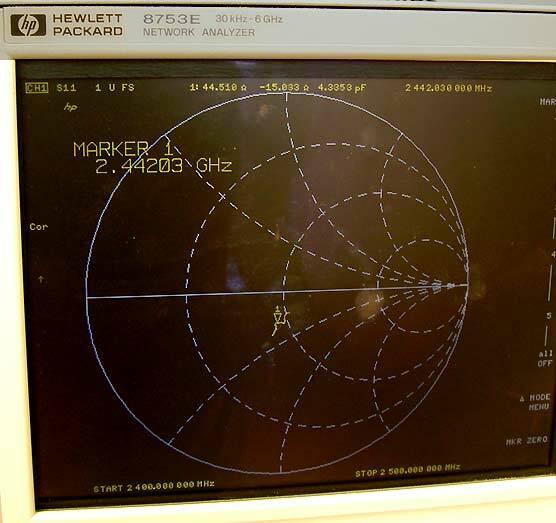 If you have a network analyzer, you can adjust your antenna to match a 50 Ohm load at 2.4 Ghz. If you don’t, then just try to get as close to the above measurements, and your antenna will still work pretty good. Now you can plug in your antenna, point it at the access point of your choice, and you are ready to go!! The main advantage of this antenna is its ease of construction. If you have all of the materials on hand you can construct it in about 15 minutes, and we get over 8db of gain. That is a very respectable gain for such a simple design. When designing any antenna at 2.4 GHz, if you have a network analyzer available I would say the most helpful thing is to make your design as tweakable as possible. You can model your design but things are so sensitive at 2.4 GHz that it is guaranteed to differ from you model. Having a design you can change after you have it constructed is very helpful (which is why we mounted ours on an adjustable screw).